If you are looking at a Natal Chart that I wrote for you, the OPPOSITION LINES in the middle of your Chart Wheel will be the color GREEN. List of planetary aspects in an Opposition! Check your Natal Chart for Oppositions! 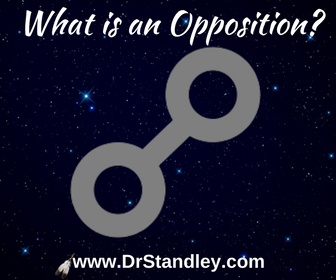 An opposition is an aspect shows a game of tug-of-war between two opposing forces, which are the two planets involved. Oppositions are considered "hard" aspects that cause friction. This is a conflict within yourself. After all, Natal Charts are all about you, not someone else. When this conflict or tug-of-war is resolved, "Kabammo!" growth and development is achieved. Imagine being the same person you were 5 years ago. Even one year ago! Now that's some reflection. It's tough enough to overcome the war within yourself without expecting entire countries to simply "get over" their conflicts overnight. It just doesn't work that way. Try telling yourself to "just get over it and set aside your differences." Go ahead, try getting over the hurts and pains from your childhood or an abusive and hurtful relationship right now. It takes time to resolve conflicts. When individuals can get a better grasp on this, then entire countries will be able to as well. An opposition is a 180Â° angle (8Â° "orb" or less) between two planets. The planets involved are directly across from one another on the 360Â° chart wheel. Naturally more than two planets may be involved due to conjunctions that are listed above. Remember, conjunctions are planets that sit side by side. And if you have two planets that are side by side which make a 180Â° angle to another planet or planets, then that creates more than one opposition. Many times oppositions will show up with regard to childhood or parental issues. Only when you become a parent or when you mature into your 40's will you finally start forgiving or understanding your parents. When oppositions are resolved, then growth takes place. You may find the tug-of-war just isn't working and that you were just being you and they were just being them. The tug-of-war can also be financial or a reflection of internal opposition with regard to your career. Depending on the houses involved, this will dictate the storyline in the conflict. The Good News? Once the opposition is resolved, growth and development have taken place. Think about the oppositions you've already dealt with in your Life and how you have grown by the experience. You may have heard stories where someone has gone through a horrific struggle, only to later say that they wouldn't change a think because they learned so much. Then their story inspires others and touches the world. Oppositions can sure deliver abundance and promise in the strangest of circumstances. Oppositions build strength, character and backbone! This is Good stuff. This is about turning lemons into lemonade. Instead of using the opposing energy to breed conflict, how about using the opposing energy to balance. Now that's a remarkable idea, wouldn't you say? Do you know what each Sun Sign's opposite Sign is? Look at the 'house cusps' in your chart, all house cusps are equal in degree to their opposite sign on the opposite side of the chart wheel. Aries and Libra are opposite signs and are directly across the chart wheel from each other. Where you see the Aries house cusp in your chart, the Libra house is directly across from it, on the opposite side of the chart in the exact same degree. Taurus and Scorpio are opposite signs and are directly across the chart wheel from each other. Where you see the Taurus house cusp in your chart, the Scorpio house is directly across from it, on the opposite side of the chart in the exact same degree. Gemini and Sagittarius are opposite signs and are directly across the chart wheel from each other. Where you see the Gemini house cusp in your chart, the Sagittarius house is directly across from it, on the opposite side of the chart in the exact same degree. Cancer and Capricorn are opposite signs and are directly across the chart wheel from each other. Where you see the Cancer house cusp in your chart, the Capricorn house is directly across from it, on the opposite side of the chart in the exact same degree. Leo and Aquarius are opposite signs and are directly across the chart wheel from each other. Where you see the Leo house cusp in your chart, the Aquarius house is directly across from it, on the opposite side of the chart in the exact same degree. Virgo and Pisces are opposite signs and are directly across the chart wheel from each other. Where you see the Virgo house cusp in your chart, the Pisces house is directly across from it, on the opposite side of the chart in the exact same degree. Libra and Aries are opposite signs and are directly across the chart wheel from each other. Where you see the Libra house cusp in your chart, the Aries house is directly across from it, on the opposite side of the chart in the exact same degree. Scorpio and Taurus are opposite signs and are directly across the chart wheel from each other. Where you see the Scorpio house cusp in your chart, the Taurus house is directly across from it, on the opposite side of the chart in the exact same degree. Sagittarius and Gemini are opposite signs and are directly across the chart wheel from each other. Where you see the Sagittarius house cusp in your chart, the Gemini house is directly across from it, on the opposite side of the chart in the exact same degree. Capricorn and Cancer are opposite signs and are directly across the chart wheel from each other. Where you see the Capricorn house cusp in your chart, the Cancer house is directly across from it, on the opposite side of the chart in the exact same degree. Aquarius and Leo are opposite signs and are directly across the chart wheel from each other. Where you see the Aquarius house cusp in your chart, the Leo house is directly across from it, on the opposite side of the chart in the exact same degree. Pisces and Virgo are opposite signs and are directly across the chart wheel from each other. Where you see the Pisces house cusp in your chart, the Virgo house is directly across from it, on the opposite side of the chart in the exact same degree. Look at the nature of the planets involved, then work that Opposition!